Why the hell someone wants to write his religion in “CV” ? Muslim ? So what ? So silly ? What if I’m Christian or atheist ? You could kill me ? Hello ? Can’t read your post, I’m repulsed. Thanks for your comments about my blog. Your concerns are very valuable to me. I really appreciate that. Now coming to second part, “Is Islam really a region of hate or terrorism?” This whole theory is sponsored by certain groups specially media tycoons. TV, radio, newspapers and magazines, are influenced by their investors or owners who have certain agendas and who want to promote certain values and points of view. So this whole thing is Mind Control game which is against Muslim these days. Read the article below, which explain Islam and its values. Don’t afraid about Islam and Muslims. Get close to them, you will find them niece and friendly. Can SQL Server Express Edition be used in replication? Let’s suppose a typical replication case. Publisher, Distributor and Subscriber are the main elements as shown below. •	SQL Server Express Edition can act a subscriber to a replication process, means that it can receive data in replication. 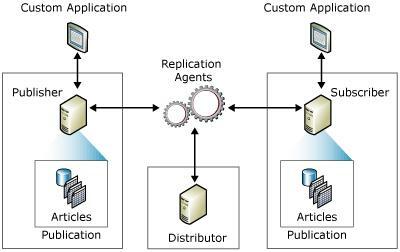 •	SQL Server Express Edition can’t act a publisher/Distributor to a replication process, means that it can’t deliver data in replication. •	So a non Express Edition of SQL Server should be used to act as publisher and in such case Express Edition SQL Server can get data as subscriber. While exploring new features of C# 4.0 , i came across with concept of memory mapped file. A memory-mapped file is a segment of virtual memory which has been assigned a direct byte-for-byte correlation with some portion of a file or file-like resource. This resource is typically a file that is physically present on-disk, but can also be a device, shared memory object, or other resource that the operating system can reference through a file descriptor. In C# 4.0, Microsoft has introduced a new namespace “System.IO.MemoryMappedFiles” for manipulating memory mapped file. CreateViewStream method of MemoryMappedFiles is used to create a stream which is mapped to memory mapped file. In c# 4.0, Microsoft has introduced a new namespace with name “System.Collections.Concurrent” which provide set of collections having thread safe behavior. The generic version of queue is explained here. Tuple is a generic type that provide an option to group together different type of object in one piece. System.Tuple is a fixed-size collection of heterogeneously typed data. Like an array, a tuple has a fixed size that can’t be changed once it has been created. Unlike an array, each element in a tuple may be a different type, and a tuple is able to guarantee strong typing for each element. Anonymous type can’t be passed as return type from a method, however Tuples can be passed as input parameters and return type. Items of Tuples can’t be identified with name, they are just called item1,item2,item3…itemn. However items of anonymous type can be named. With introduction of Tuples, C# has provided one more feature of functional programming languages. Composable part (or, simply, part)—A part provides services to other parts and consumes services provided by other parts. Parts in MEF can come from anywhere, from within the application or externally; from an MEF perspective, it makes no difference. Export—An export is a service that a part provides. When a part provides an export, it is said that the part exports it. For example, a part may export a logger, or in the case of Visual Studio, an editor extension. Parts can provide multiple exports, though most parts provide a single export. Import—An import is a service that a part consumes. When a part consumes an import, the part imports it. Parts can import single services, such as the logger, or import multiple services, such as an editor extension. Contracts—A contract is an identifier for an export or an import. An exporter specifies a string contract that it provides, and an importer specifies the contract that it needs. MEF derives contract names from the types that are being exported and imported, so in most cases you don’t have to think about it. Composition—Parts are composed by MEF, which instantiates them and then matches up exporters to importers. In this example, we will implement different methods of calculator via Managed Extensibility Framework-MEF. 1. Create a C# Console application with name “MEFDemoApp” with solution name as “MEFDemoAppSol”. 2. Add a C# Library project to solution with name “MEFAppLib”. 3. Add reference to “System.ComponentModel.Composition.dll” in both projects. 4. Add reference of console application (MEFDemoApp) project in Library project(MEFAppLib). 5. Change Build Output path of C# library project in project properties to “..\\MEFDemoApp\\bin\\Debug”, so that dll created for Library project is copied to console project. Note here that Export attribute is used to show that this is a service that is provided to others. In the above example, we have created two extensibility examples by implementing interfaces using import and export attributes. MSDN Team have provided complex cases, but to make things simple I have provided a new version of calculator via MEF, hope you will like it. If you have worked in OR Mapping technologies like linq 2 sql or nhibernate then you must be aware of concept called ”Lazy loading” which suggest that a object/collection as property in a object is not created till it is accessed in the code. Similar is true for “Lazy initialization” which is provided with Lazy class at System.Lazy(Of T). It proposes that an object is not created till it is used by the first time the Lazy(Of T).Value property is accessed or the Lazy(Of T).ToString method is called. Defer the creation of a large or resource-intensive object or the execution of a resource-intensive task, particularly when such creation or execution might not occur during the lifetime of the program. Suppose there is an object doing very heavy processing going on in its constructor. Constructor for HeavyWeightObject.. Doing a lot of processing..
Notice that when line 3 executes, then constructor is not called, because of lazy initialization. When line no 5 executes, .value property is accessed at this point, so is constructor called, this is because of lazy initialization. You are currently browsing the SoftArchitect blog archives for August, 2010.